I have to start by wishing Mel a very happy publication day!! Though she has written many books I’ve only read two, the books in the Eden Berrishford series and I’ve not read any of her psychological thrillers before, and boy have I been missing out! 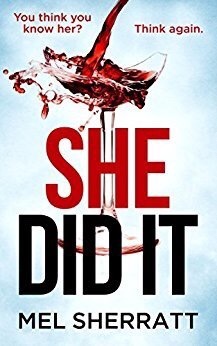 While her other books are more dark and gritty, this one was still dark, albeit in a different manner but there was still a very strong sinister vibe and twists and turns aplenty. The story focuses on two women, Tamara and Esther who at first glance seem worlds apart, but upon further inspection they may have more in common than meets the eye. Both have secrets in their pasts that they would like to keep quiet and both have a history of instability, making me constantly question who was reliable or if either of them even were?! The lies and betrayals run deep with these two and they both seemed to have hidden agendas that weren’t revealed until the end. True to Sherratt’s usual form this opens with a tense scene then flips to three months prior and it also occasionally flashes to the present day. This is fairly fast paced and kept me on my toes throughout as I tried to piece together the past events as well as try to connect them to what was happening currently. Sherratt has the unique ability to create characters that are memorable but also believable, the scenarios she conjures up are scary because you can actually imagine them happening, there is a realism to her writing style that is riveting. I feel like I’ve said enough in terms of the plot, but if you like psychological thrillers you will enjoy this one. That sense of uneasiness and dread is felt throughout, the various plot threads come together in a stunning way and the ending had the exact type of chill that I adore in a great book!